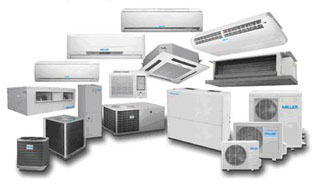 In a solar air conditioning system the sun is used as a heat source to reduce the energy needed to drive the cooling process of a typical air conditioning system which in turn reduces the electrical energy required to run the compressor. The solar air condensing system is similar to a standard a/c in that the refrigeration takes place by evaporating liquid with a very low boiling point. In both cases, when a liquid evaporates or boils, it absorbs energy in the form of heat and can continue to do so either until the liquid is all boiled or until everything has become so cold that the sub-zero boiling point has been reached. The difference between the two is how the gas is changed back into a liquid so that it can be used again. A standard air conditioning system uses a compressor to increase the pressure on the gas, forcing it into a liquid in the condenser coil. The change of state of the refrigerant starts to take place approximately 2/3rds of the way down the condenser. 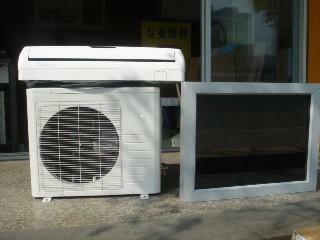 The solar air conditioning system uses a different method. It uses the heat from the sun to superheat the refrigerant which enables it to begin changing state in the top 2/3rds of the condenser coil. By using this method it reduces the superheat of compression required to achieve the cooling process in the conventional cooling system as well as utilizing more of the cooling face of the condenser coil. The conventional cooling system is only able to change a portion of the gas into a liquid state so that as it enters the metering device it is a saturated vapour. The Solar Hybrid Air Conditioning process allows more of the refrigerant to change state back into a liquid faster as well as allowing the transformation of more liquid into the metering device. In a hybrid solar ac system the low pressure, low temperature refrigerant is compressed before being superheated in the heat exchanger of the solar absorption panel so that we now have both high pressure and superheated vapour. Then the vapour is condensed into high pressure liquid at ambient temperature by passing through the condenser. The high pressure liquid is converted into low pressure, low temperature liquid at room temperature when it passes through the capillary in the fan head. This is achieved by throttling and decompression of the liquid into vapour at low pressure and low temperature. This phase change absorbs energy out of the room in the condenser inside the fan head. Air is blown through the condenser to distribute the cooling throughout the room. Moisture forms on the surface of the condenser where it is piped away to top up the solar thermal heat exchanger. In the heating cycle, the condensers are reversed in sequence, so that heat energy is released in the fan head instead of outside.